June 26, 2019, International Day Against Drug Abuse and Illicit Trafficking. Hengyang City, Hunan Province, China. 1) Size: Min: A4(210mmx297mm), Max:A3(297mmx420mm). 4) Participants are requested to send together with their cartoons, an entry-form with digital signature, a photograph or caricature. The form can be downloaded at FreeCartoonsWeb(www.fcwfcw.com). 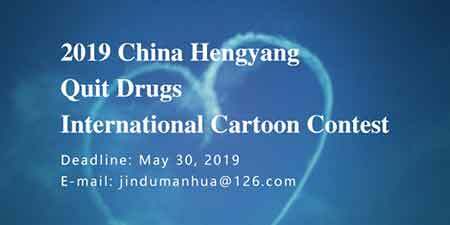 China Hengyang City Drug Control Committee Office. China Hengyang PSB Literature and Art Union.